It has been confirmed via various sources online that tomorrow’s (surely) Championship-winning clash with third-bottom Dumbarton is now a complete sell out with every home seat expected to be filled for the day Rangers finally seal promotion to the Premiership. 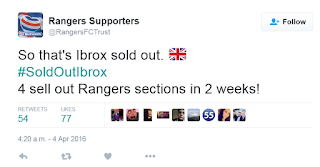 According the RST’s official Twitter account, around 50,000 Bears will pack Ibrox tomorrow night to see Mark Warburton’s men clinch the title with several weeks still remaining on the season’s schedule. It is a far cry from last season where Stuart McCall’s side failed to even finish runners up, and now allows Rangers’ management to concentrate on building for next season, where today the gaffer confirmed Harry Forrester’s new deal is nearly complete, and that he will also be prioritising defensive midfield as a key position required for the assault on the Premiership next season. 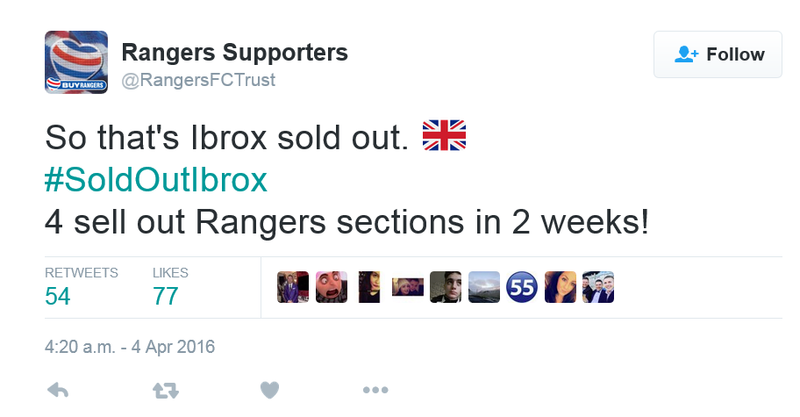 It now seems that Rangers are formally 90 minutes away from the title, and a packed Ibrox will witness it. The team and the fans truly deserve this opportunity to make it a great occasion. I am so pleased for young Barry McKay, after the poor way he was treated by Ally McCoist (forgive him, cause he did not have a clue) Andy Halliday, and of course the rest of the team for being so consistent and playing some wonderful attacking football (even when they should have changed things a little when in front to make us harder to score against). Special congrats to the management team and all the background staff. see you at the party, no surrender WATP. Well done to all concerned we have been waiting 4 years to get us back to where we belong WATP LOL. Gonna be a very special night. to-night...the whole of Scotland will see why RANGERS are Scotlands number 1 team..with the best support.I live in Canada now but still hasnt changed my passion..no matter whats happened...and never will....cmon the RANGERS,play your best and show why, this club means soooo..much to your fans!! WATP...!! !